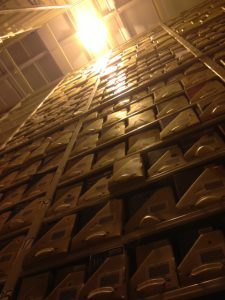 The 12,000 square foot storage module at U1 can hold approximately 1.4 million items, which are organized in five aisles, and each containing two ranges. The approximately 30 feet tall stacks are accessed by UMLD staff on a Raymond® narrow aisle heavy lift truck. Our “Raymond” is equipped with a safety basket which allows people to move about at height with minimal risk. UMLD is managed by the Vice Provost for University Libraries through the Access, Collections and Technical Services (ACTS) Division Head and on-site staff. Though the storage facility is not designed for direct user access, a range of services allows browsing through MERLIN, and the retrieval of materials for patrons to use in their homes, offices, other libraries, etc. 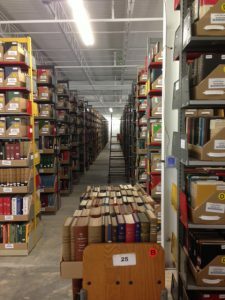 Access to materials stored at UMLD is through MERLIN, the integrated library catalog of the UM libraries. The on-site staff endeavor to provide 24-hour turn-around from UMLD to the mail facility on the requesting campus Monday-Friday. Monographs are delivered through UM courier, commercial courier, or the local MU Libraries transportation system within 24 hours of receipt of requests. Please note: requests made on Friday afternoons will not be available until the following Monday. Delivery methods for periodical articles and other scanned material include email, fax and other rapid services. UMLD Scan-and-Deliver requests are handled in the order they are received and are generally filled within 24 hours. 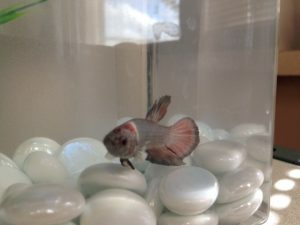 Rush requests are sent within 4 hours. Please note: requests for scanned materials are limited to a maximum of 50 total pages, including all applicable pages, plates, pictures, inserts, and other included items. Requests for scanned materials in excess of this limit will be cancelled. If you require access to more than 50 pages of an item, please place a request for the physical volume. All requests for scanned materials will be completed in accordance with copyright laws and guidelines. 1.) Perform your search in MERLIN. 2.) Select REQUEST when you find your item. 3.) Enter Pawprint and password. Pawprint not working? 1.) Select the REQUEST button in MERLIN for journal volumes. *Maximum of 50 total pages. 3.) Login to ILL@MU to request articles in journals from other campuses’ Depository holdings. 1.) Perform your search in MERLIN and select an item. 2.) Select Save to Folder. 3.) Repeat these step until you have have finished searching. 4.) Select View Saved Records. 5.) Select Multiple Requests (select this even if you have saved only one book in the Folder). 6.) Before entering information, scroll down to the bottom of the page to see the saved titles. 8.) If you choose Select All or Request Saved, follow steps 4-8 as for Ordering books via MERLIN. For persons not affiliated with MU who wish to drive to MU’s Ellis Library to look at an item from the Depositories, please contact the Ellis Library Circulation Desk at 573-882-3362. For anyone who is not affiliated with MU and not within driving distance, please contact your local library to ask for an interlibrary loan. In 1992 the Coordinating Board of Higher Education (CBHE) recommended that $8.5 million be appropriated by the Legislature in the FY94 budget to begin the construction which would complete the expansion of Ellis Library, the main library on the Columbia Campus (MU). The Governor accepted CBHE’s recommendation, and initially his budget request for FY94 included the line item for $8.5 million. In December 1992 University of Missouri President George Russell asked the Governor to remove that item from his budget request. The President explained he had reached the conclusion that the University needed to re-evaluate its library facility needs on all four campuses. In view of this re-evaluation, the University did not wish to complete the expansion of MU’s main library (The President later revealed that he made this request based upon the wishes of the newly appointed Chancellor of the MU Campus, Charles Kiesler, who had assumed his duties in November 1992). Lacking a plan to alleviate its severe space problem, the MU Libraries continued to pile books on the floors in Ellis Library. The other three campuses, Kansas City, Rolla, and St. Louis also had concerns about future needs for additional library space. This was particularly true for the Rolla Campus, whose library had run out of room and also needed renovation. In April 1993 President George Russell, Vice Presidents Ralph Caruso, Jim McGill and Richard Wallace, together with consultant Robert Chartrand, traveled to Washington, D. C., to find out how libraries there were addressing their facility problems. They visited the Library of Congress, the National Library of Medicine, the National Agricultural Library and the library of American University. While in District of Columbia, they learned of the plans for the new library depository being built for the consortium of universities in the Washington area. In September 1993 the University of Missouri submitted to CBHE its budget request for FY95 which contained one University-wide item for capital construction. This specific item, for a library storage facility priced at $4 million, was presented in lieu of any expansion of library facilities on the University’s campuses. In October 1993 University President George Russell appointed the Advisory Review Panel for Assessment of Library Needs, composed of administrators from five other institutions, and chaired by Jay Lucker of MIT. In December 1993 the Library Directors and others, including Jim Goodrich, Executive Director of the State Historical Society, met with the Panel in St. Louis to review their campuses respective library facilities and the need for library space on each campus. Following that trip, a commitment to build a depository, based upon the Harvard model, was made. 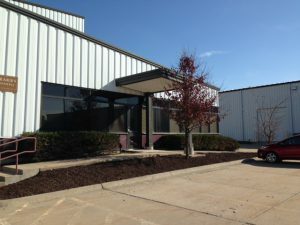 Within a short time the construction process began on Lemone Industrial Boulevard in Columbia, about three miles from the MU Campus. Ground was broken on the site in June 1996. In October and November, the foundation was poured and supports for the structure were installed. Construction continued throughout the winter. By Christmas 1996, the framework was largely installed, and the shape of the building was evident. Immediately following New Year’s Day 1997, the floor of the front office area was poured. Crews then moved on to the storage area. The specification for the storage module floor called for an exceptionally flat surface. After the cement dried, the floor was ground and polished to achieve the desired flatness. After the floors were added, workers began applying the outer skin of the building. By spring most of the exterior and roof were in place. Windows and doors were mounted, giving the building a more finished appearance from the outside. In late May of 1997, entrances to the storage module were completed, and the wall coverings installed. Insulation and a vapor barrier covered each wall. The specially covered walls would eventually be used as critical parts of the climate control system in the storage module. In mid-June, custom shelving for the storage module arrived on-site. The air handlers, situated above the storage module in the mezzanine, and the parking lot were also added. By the end of August, the shelving was installed, periphery guardrails were added, and a final floor coating was applied. The University of Missouri Libraries Depository began operations in the fall of 1997. The first holdings to be placed in the Depository were volumes from the University of Missouri – Rolla which had begun an extensive renovation of the Curtis Laws Wilson Library. A formal opening ceremony for the Depository was held on April 24, 1998. 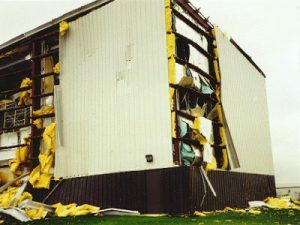 A tornado hit the Depository in the early hours of November 10, 1998. Structural damage occurred to the south wall. The east wall also was damaged badly, and more than half the roof was destroyed. Fortunately the books which had been placed in the Depository to that point were not damaged. A consultant was hired to examine the volumes housed in the facility, and she found no evidence of mold or water damage. Immediately following the storm, a period of cold, fair, and precipitation-free weather allowed for a rapid and relatively trouble-free recovery. Repairs to the Depository were made sooner than had been estimated, and the facility was back in full operation within a few months. 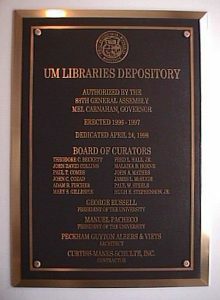 The UM Libraries Depository officially unveiled its dedication plaque in the fall of 2002. The UM Library directors, esteemed guests, and those integral to the management and maintenance of the facility were invited to view the unveiling on October 31st. The following summer, the collection at UMLD reached one million books. “William Rainey Harper” by Goodspeed was received on June 30th 2003, the last day of the 2002-2003 fiscal year. The UM Libraries Depository continues to serve the UM Libraries community, the UM System and beyond. June 1996 Construction of UMLD begins. November 10, 1998 In the early morning hours Columbia Missouri was struck by a tornado. UMLD suffered significant damage during this weather event. October 31, 2002 UM Libraries Directors, and other esteemed guests, gathered at the UM Libraries Depository for the dedication plaque ceremony, and unveiling. 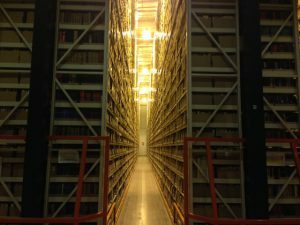 June 30th 2003 UMLD added to its stored volumes its one millionth book. March 1st 2007 U2, the second module of the UM Libraries Depository comes online. U2 is a 27,000 square foot storage space in the Columbia Subtera. 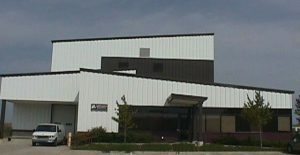 June 30th 2014 U2 Subtera space is vacated and new U2 facility opened near Midway.